They did not win any title last season and their last cup win was in 2013-14 season where they won the Copa Del Ray, their last La Liga title win was in 2011-12 when Jose Mourinho was their manager. RealMadrid are currently third on the table with 30 points in the 15 games played, below Atletico Madrid by five points and above Celta de Vigo by two points. Rayo Vallecano are struggling to survive in the league as they are currently in the relegation zone and have 14 points in the 15 games played, they are 18th on the table. 20th December 2015 at 20:30 IST. But you can say that La Liga have teams like FC Barcelona who are too much overpowered with the likes of Lionel Messi, Neymar Jr. and Luis Suarez and can single handedly destroy any team but Madrid also have the likes of Cristiano Ronaldo, Benzema and Gareth Bale which are no less than MSN, but they haven’t achieved what Barcelona has achieved as a team. They can do it, it’s in their blood and everyone knows that, that’s why no team take RealMadrid easily. They are going through a rough patch but they need to focus on the best thing they can do, that is play good football. They played Villarreal in their last game at the El Madrigal and lost by 1-0 in a very crucial match as they had the chance to move closer to the top two. Roberto Soldado scored very early in the game in the 8th minute and that was enough for Villarreal to get the win. Rayo Valecano have only won one, drew one and lost three in their last five games and are currently in the relegation zone with only 14 points on the table. They need to do something about it or they will be relegated. They played Malaga at their home and lost by 1-2. Javi Guerra scored in the 6th minute to give the side the lead but that lead was gone in the second half as Charles scored in the 59th minute to equalize for Malaga and in the 87th minute Duje Cop scored the winner for his team and Malaga won the match. Navas, Danillo, Pepe, Ramos, Marcelo, Modric, Casemiro, Rodriguez, Bale, Benzema, Ronaldo. Yoel, Tito, Llorente, Amaya, Nacho, Roberto, Jozabed, Lass, Hernandez, Bebe, Guerra. Madrid should win this won easily as they have a very strong team. 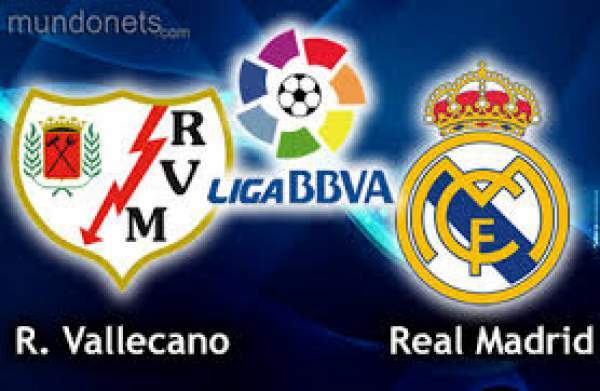 Stay tuned for more updates, we will update you with every news of Rayo vs Real here, on this page. Do return here after the match to get result, video highlights, full/complete scorecard/scoreboard and much more. Don’t forget to share it with your friends over social networking sites like Facebook, Twitter, Google Plus and others.